NASHVILLE, Tenn. – Winnipeg-based Paul’s Hauling is among the first fleets to adopt Dana’s newest offering, Rhombus Tire Analytics. Dana officials said at the Technology & Maintenance Council meetings the company is looking at new ways to help its fleet customers improve profitability, including in areas not related to its traditional product lines. Rhombus TireAnalytics, a new mobile app that helps fleets better understand and control their tire-related costs is an example of this. Dana’s SPL 350 Lite driveshaft. Trent Siemens, director of maintenance at Paul’s Hauling said he had been seeking a tire management software solution for more than a year. Siemens also wanted a product that would assist him in enforcing company policies and procedures and to bring more consistency to the fleet’s tire management practices across its terminal network. Rhombus TireAnalytics allows technicians to quickly photograph tires and input tire data. The system has already helped Paul’s Hauling identify an area of concern. “Shortly after going live with the product, I was going through alerts and noticed an abnormally high volume of valve cap replacements. We made a change to the product we were using and it’s something I wouldn’t have seen through spreadsheets before,” Siemens said. Dana also introduced new offerings to help fleets achieve fuel savings through downspeeding. 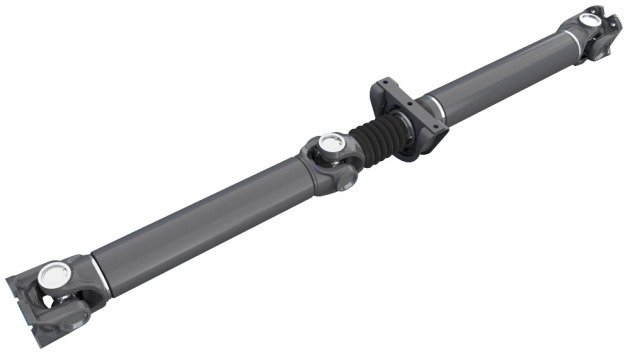 A new SPL 350 Lite driveshaft is 35 lbs lighter than Dana’s existing offering, while providing the durability needed in downsped applications. It features 11 fewer parts than its predecessor and is faster and easier for OEMs to install in their vehicles, said Steve Slesinski, director of global product planning with Dana. “Adding that ratio makes this the broadest offering of ratio coverages to support downspeeding with 6×4 tandems in the marketplace,” Slesinski said.